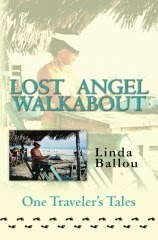 Lost Angel Walkabout, the perfect travel companion, is now available on Amazon’s Kindle. 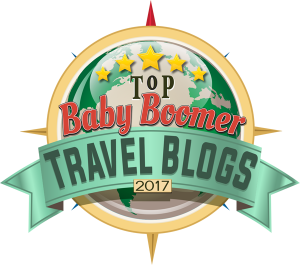 This eclectic collection of 28 travel essays is filled with thrills, spills, giggles and squeaks. 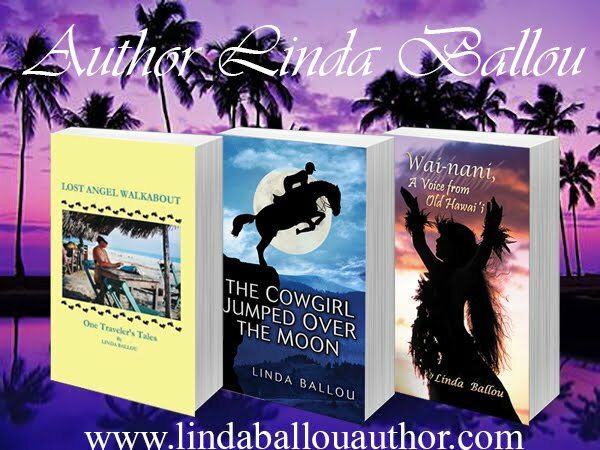 Adventure travel writer, Linda Ballou, takes you river rafting in Alaska, trekking in New Zealand, kayaking in the Sea of Cortez, sailing around the Napali Coast and horseback riding in the wild west of America. 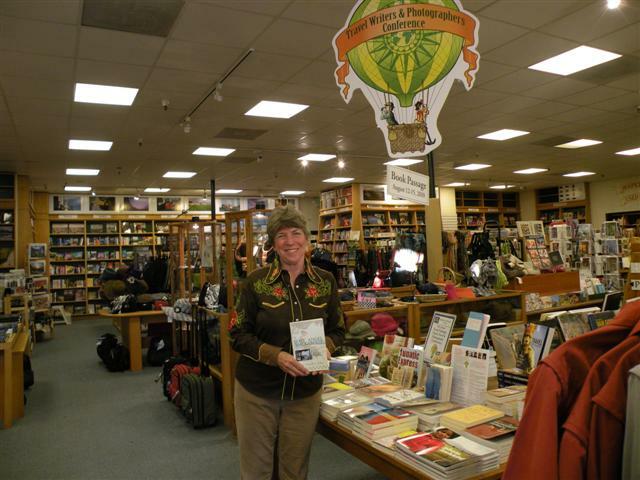 Have fun with Linda, while getting to your own adventures, without tipping your canoe or straining one muscle. I walk in beauty on the good red road. I was honored to have my picture taken with Don George, the master of ceremonies, of the Travel Writing Conference at the Book Passage and Tim Cahill who opened the festivities with a fun talk. 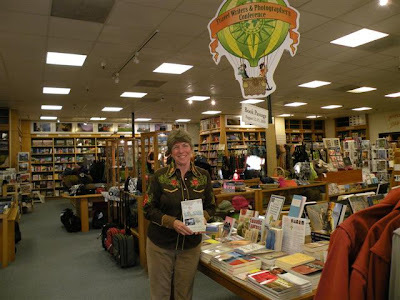 Don has edited numerous travel essay anthologies for Lonely Planet and has a great website with tremendous information for travelers called Don’s Place. His book Travel Writing published by Lonely Planet is the most comprehensive book on the subject, I have come across. 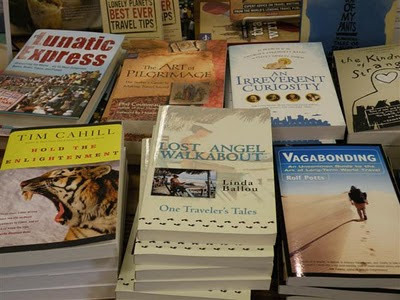 Tim Cahill has nine travel book under his belt and hundreds of articles, is nothing short of the master when it comes to adventure travel narrative. I had the pleasure of interviewing Tim in his home in Livingston, Montana among the many artifacts he has collected in three decades of adventure travel. You may read that interview in my book Lost Angel Walkabout-One Traveler’s Tales. 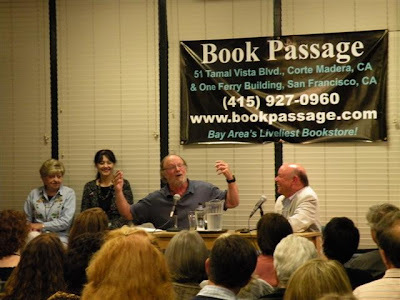 Tim Cahill regaled the audience with stories at the Book Passage Travel Conference. 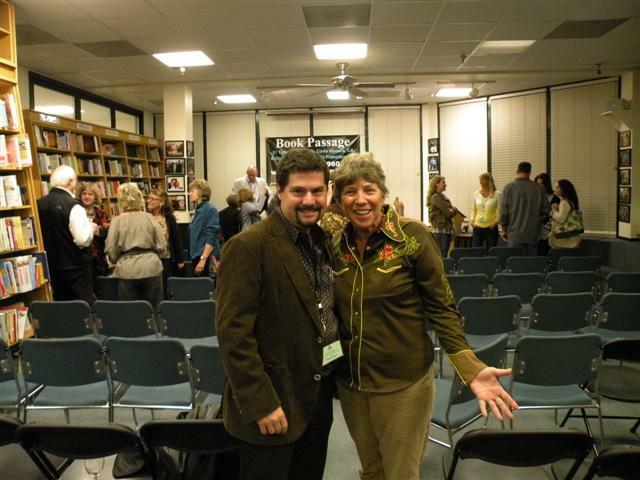 Tim is America’s best known and funniest travel writer, founding editor of Outside Magazine and is the author of more than 7 books. 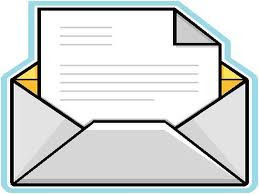 In his writing classes he teaches aspiring authors how to achieve “Flowbie.” This is a state of mind in which you are so totally engaged by your own imagination that you lose sense of time and place and awake a couple hours later with writing that you never knew you had in you. Tim’s conversational style is always educational and is often laugh out loud funny. I had the pleasure of interviewing Tim in his home in Livingston, Montana among the many artifacts he has collected in three decades of adventure travel. 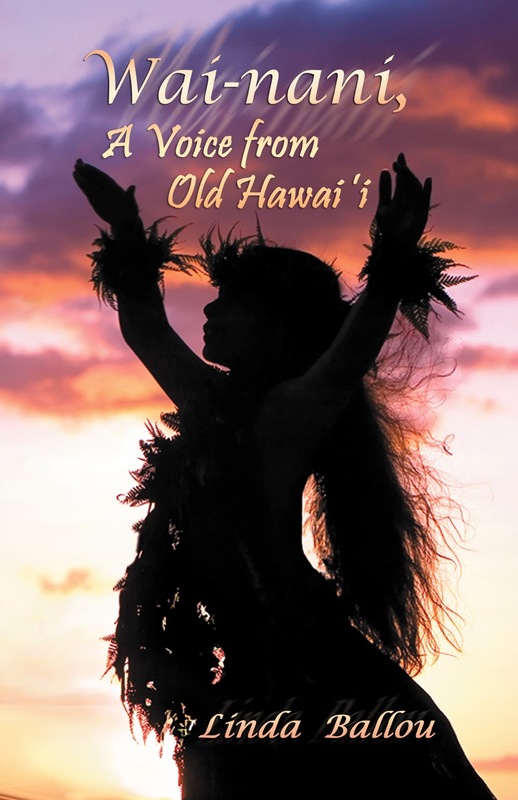 You may read that interview in my book Lost Angel Walkabout-One Traveler’s Tales. 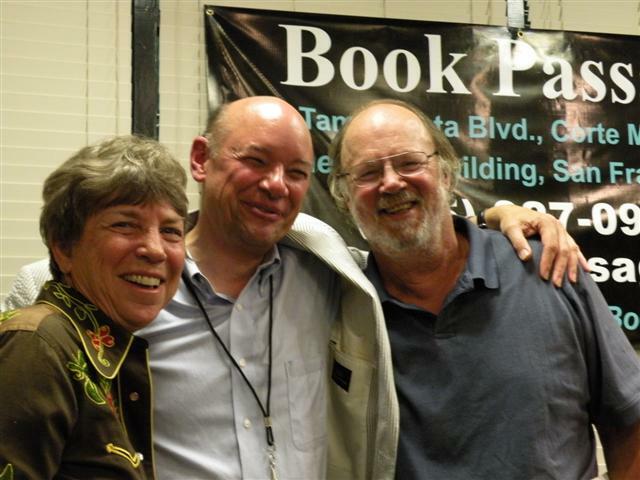 I was very proud to rub shoulders with the best travel essayists alive today. 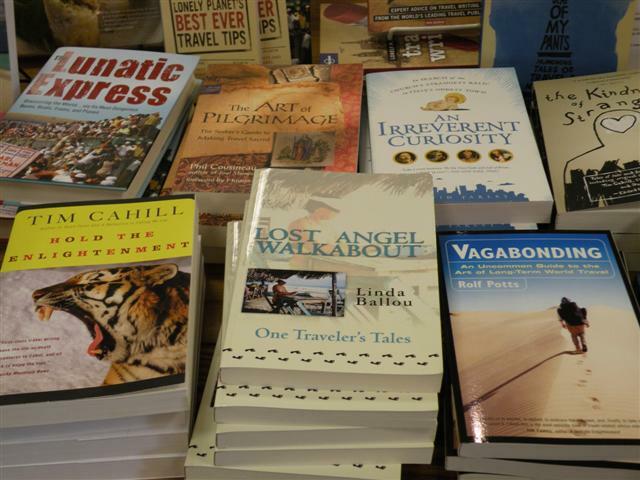 Lost Angel Walkabout-One Traveler’s Tales my second novel is nestled between Tim Cahill’s, Hold the Enlightenment and Rolf Potts, Vagabonding on center stage at the Book Passage Travel Writers Conference. 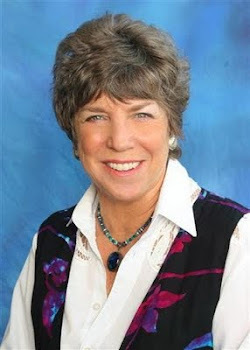 While I came to share my work with others, I did not expect to receive encouragement and inspiration to carry forward. Phil Cousineau, an author I was not familiar with before I arrived, gave a talk about Stoking the Creative Fires. 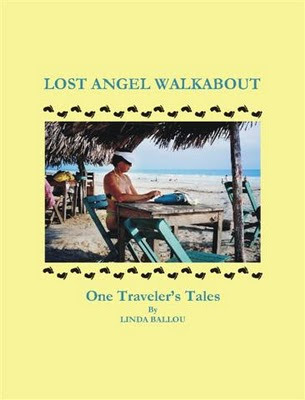 I didn’t realize it, but since the publication of my second book in May, Lost Angel Walkabout; One Traveler's Tales, I have been suffering from post partum. After listening to this brilliant, accomplished individual who has thought deeply about the subject of “Why Bother” to create, I felt not only justified but eager to get on to my next book! Cousineau’s theme that art for “beauties sake” is worthwhile in our lives reminded me of John O’Donohue’s wonderful book The Invisible Embrace of Beauty. O’Donohue’s words re-enforced my own strong belief that “the secret to youth is to fill your mind with beauty.” Not that you will look any younger, but that your spirit will be replenished and freshened when your life is filled with beauty—be it a song, a book, a landscape or the smile of a child. I felt overwhelmed by a sense of serendipitous synchronicity when Cousineau revealed that he was a close friend of O’Donohue. I was saddened to learn that this thought-provoking man had died a year earlier at the age of 53. Perhaps, his work was done. I left the conference feeling mine had just begun. Early the next day, we headed out from Punta Baja. Just as we crested the point, we saw a blue-footed booby and a pod of about thirty dolphins. The dolphins churned past us in a steady rhythm, making a beeline up the channel. After a brisk paddle into the wind, we were gliding on shallow turquoise water again, so clear I could see to the white sand bottom. The beach was composed of whited powdery sand, wrapped in white cliffs with fat, chalk-colored stalactites dripping from the ceiling of the sea caves. Standing on the cliffs were black cormorants with their wings spread in the sun to dry, looking like scarecrows. A deep blaze of aquamarine green, so intense it glowed like a laser beam, shot across the width of the passage. A week of yoga before breakfast, several of hours of paddling prior to lunch, a siesta and then a swim, left me feeling amazingly fit. So when our group was challenged by another cluster of kayaks to a race across the idyllic glide to Honeymoon Cove, I was game. I poured on the steam, gave it all I had and applied all the technique I had learned that week. 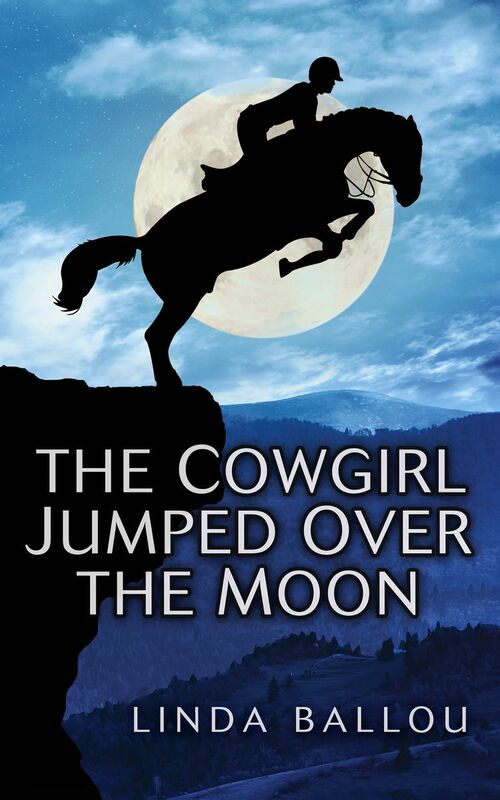 Having arrived at the tranquil Honeymoon Cove, I climbed to the top of the red bluffs that sheltered it. I peered down into water so clear that from several stories up I could see schools of fish. From this perfect vantage, I let my imagination run wild wondering what treasure might have been left behind by pirates who had come to this part of the world looking for a sage harbor. My trip sadly came to a close, but I was very happy that this unique land that time almost forgot is only a few short hours from home. "I'll be back," I promised myself. The second day, we slid into the opalescent water early in the morning to beat the afternoon winds and were welcomed by a comfortable eighty degrees with a teasing breeze and rocking swells; it was a perfect paddle day. The deep water crossing from Danzante to Carmen Island is a wide stretch of open water that can present a challenge. Fernando, our local guide from La Paz, was paddling in perfect rhythm in the cockpit behind me, so I enjoyed a great sense of security. The cliffs on the backside of Danzante display red sandblasted arches carved by ferocious Chubasco winds. Fernando pointed to a window in the rocks several stores up that navigators use to get their bearings. There are no beaches or trails on this side of the island, so kayaking is the ideal way to explore. We slipped up close to the cliffs to get a closer look at the sea caves. It was there I spied the nest of an osprey. On the water, the natural flotsam consists of moss algae, sponges and the occasional jelly fish - the size of a dinner plate. We glided over boulders populated by magenta starfish and spiny purple urchins. Because there is no engine noise in a kayak, the wildlife doesn't scatter upon your approach. It allows you the sensation of being part of this translucent water world while remaining safe from the dangers of the deep. The Sea of Cortez is the youngest sea on earth, a mere 25 million years old. It is cradled by rugged lava-rock cliffs that are embedded with numerous sea caves. Earthquakes generated from the San Andreas Fault created deep water canyons and separated the peninsula from the mainland. Strong ocean currents continually mix and lift food and nutrients from the deep ocean canyons, making this the perfect feeding ground for all types of marine mammals. We quickly made the crossing to Punta Baja, where gulls greeted us with what sounded like hysterical laughter. A troop of pelicans flew close to the water in a "V" shaped wedge, webbed feet lowered for a splash landing. A lone, great blue heron held his station on the point, undisturbed by our arrival. The littoral was thick with shells, big corkscrew spikes, small orange cones and bivalves of every description. The shells in the fossil bed at Punta Baja are said to be as old as the sea itself. Just as quickly as the ball drops on New Year's Eve at Time Square, the sun slid behind the windblown mountains, leaving a chill in the air. While others chose to sleep under the star speckled skies, I unraveled my tent poles and set up house. When I unzipped my bedroom at sunrise I was greeted with the sight of soft, muted mauves and purples draping over the Isla Montserrat. I watched the sun lift its warm face over the shimmering mirrored surface, turning the sky to an opalescent pink. In the distance, dolphins did somersaults. It was time for breakfast; eggs with cactus, tomatoes and guacamole. We were a tribe now, accustomed to each other's morning face. 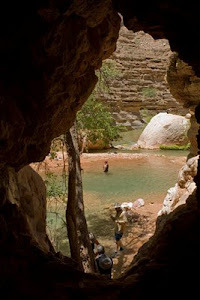 We were becoming deeply immersed in the peaceful and unhurried rhythms of Baja. At Arroyo Roja, we enjoyed a view of lava cliffs. A row of rock fingerlets, where Sally Light-foot crabs scuttled at my approach, made for fun tide-pooling. Underwater, I spied on Sergeant Majors, parrot fish, stickfish, and Rainbow Wrasse as they flitted in and out of the oatmeal-colored algae. I floated over boulders peppered with starfish and anemones. I felt light years removed from my ever-present thoughts of danger and worries and from the question that eternally plagued me, "what's for dinner?" 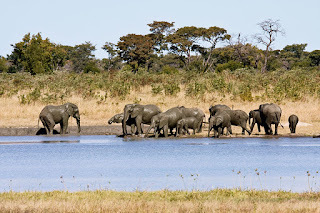 I am certain that the sights that surround me are much the same as those experienced by John Steinbeck and his crew of naturalists when he explored the region in 1941. As I recall their early adventures, our head guide Jackie, brings me back to reality as she tells us that we are about to be introduced to muscles we never knew we had. Our group of twelve, all in varying degrees of physical fitness, receives instructions to push, not pull the paddle, so as not to become overtired. We are to use a flat palm, and a loose thumb on the paddle, ore else suffer from tendonitis. As I donned my life vest, I began to fear that I might have made a terrible mistake. Much like the pelicans I had been watching just moments before, I too was an awkward disaster just waiting to happen. I prayed that like them, I would acquire grace once in action. I remembered the outfitter's literature, promising that by merely practicing a few exercises prior to the trip, any reasonably fit person could enjoy the thrill of gliding over serene waters in a sea kayak. None-the-less, my stomach churned as I contemplated the fact that within moments, nothing but a thin shell of fiberglass would separate me from the deep blue waters of the Sea of Cortez. Before I could further consider my fears, we were off. At three miles an hour, it would take us an hour to reach our first stop at Danzante Island. I soon found myself enjoying a unique sense of freedom. There I sat, balanced neatly on the bow, watching as swarming shoals of fish darted below and pelicans scooped dinner into their fleshy pouches. I felt like a dolphin riding the crest of the waves - finally fearless! . . . .
By the time we stopped for lunch, I was thrilled at being in this vast ocean wilderness. As we cruised across the waters, the brilliant sun beat down upon us. I was eager to escape the heat and experience the underwater world of marine life. Clad in snorkel gear and fins, I prepared to enter the waters Steinbeck had dubbed, "ferocious with life." Biologically the richest body of water on the planet, the Sea of Cortez supports over 900 species of marine vertebrates and over 2,000 invertebrates. As I slipped into the transparent waters that lure outdoor adventurers from around the globe, all that was visible was the rust color of the cliffs surrounding our beach camp and a few darting electric blue fish. The sea shelf dropped off abruptly to depths where there is no visibility, so I headed back to my group and the lunch that awaited me. Just moments after leaving the water, a fin whale the size of a city bus emerged, arching its great girth. Stunned that I had been just feet away from this behemoth creature that swills krill by the ton, and has a heart the size of a Volkswagen, I realized I needed to be more alert during my explorations! Stay tuned for more of Linda's adventures on Day 2 in the The Land That Time Almost Forgot.